Start Your Dream Home Improvement Project Today! If you’re shopping around for new siding, sliding glass patio doors, replacement windows, or another exterior home improvement product for your home, you’ve found the right contractor for the job. ABC Seamless of Cheyenne, Wyoming, is an authorized ABC Seamless dealer with a track record of providing top-notch customer service, unbeatable craftsmanship, and dependable home improvement solutions for homeowners throughout Wyoming and Colorado since 1997. We Provide Unbeatable Customer Care and Exceptional Craftsmanship. The Siding Without the QUACKS! Combine the durability of steel with our seamless technology and homeowners have a product that will make their homes look great for decades to come. Maximizing year-round comfort and energy savings in every room of your home is a snap when you replace your old windows with 100% Energy-Star Rated ABC Windows. Our seamless steel gutters have a 30 percent larger capacity than standard options and are precisely cut to fit your home from the same high-grade steel as our siding. We can also install dependable gutter covers to protect against clogs. When you have high-quality steel soffit and fascia properly installed on your home, you’ll be protecting your home’s roof areas from moisture that can lead to mold growth and wood rot. Our steel shingles protect your home in any climate and disaster, proven by Fire, Wind, Fade and Impact ratings. 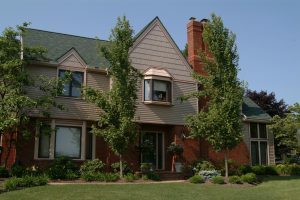 Surpassing the best asphalt shingles in every way, upgrading to a steel shingle will increase the resale value of your home and put your mind at ease . We also specialize in multiple aspects of home improvement, including soffit, fascia and siding installation. However, our house siding isn’t the typical pre-cut vinyl panels you may expect from an ordinary home remodeler. Instead, our siding is fabricated from 28-gauge, hot-dipped G-90 galvanized steel and is cut to the exact specifications of your home. This means virtually no maintenance, and no ugly seams. Truly, it’s siding without the QUACKS! ABC Seamless of Cheyenne is your go-to crew for window installation, too. Manufactured in the USA, our house windows are constructed with premium-grade virgin vinyl, are certified by ENERGY STAR®, and feature a double layer of energy-efficient glass coating to reflect radiant heat and maximize your home’s thermal performance. This can translate into reduced monthly energy costs and a more comfortable indoor temperature year-round. Beyond seamless siding and vinyl windows, our quality steel roofing and gutters are engineered to provide outstanding durability while adding a touch of style to your home’s exterior. Both of these products are available in multiple colors to coordinate with any home. Our seamless steel gutters have a 30 percent larger capacity than standard K-style options and are precisely cut to fit your home from the same high-grade steel as our siding. We can also install dependable gutter covers to protect against clogs. And, our ENERGY STAR® certified metal roof systems feature Cool Roof Technology, are fabricated to mimic the beauty of wood shakes or slate, and come with the assurance of a lifetime warranty. To find out why we’re your trusted choice among home improvement contractors, and to learn more about having any of our top-notch products installed on your home in Wyoming or Colorado, contact us today! Our Installs Come with the Assurance of a Lifetime Warranty! You’re not just a customer, you’re our neighbor – and we’ll treat you like one. Our factory-trained and -certified technicians will ensure a flawless installation for your home. We’re proud to be recognized by the Better Business Bureau for our dedication to providing top-notch customer service. We wont rest until you are full satisfied with the results of your project. Check out our photo galleries including numerous examples of the stunning work we’ve completed for our customers, and imagine for yourself the possibilities we can create at your home. © 2019 ABC Seamless of Cheyenne. All rights reserved.